Though the war ended, Peter II was not allowed to return home. He was deposed by Yugoslavia's Communist Constituent Assembly on 29 November 1945. After that, he settled in the United States. From 1962 to his death he served as the Royal Patron of the Sovereign Military Order of the Temple of Jerusalem in the United States. After many years of suffering from cirrhosis of the liver, he died in Denver, Colorado, on 03 November 1970, after a failed liver transplant. He was interred in Saint Sava Monastery Church at Libertyville, Illinois in United States. After Peter II's was deposed, the government changed the name of the country from Democratic Federative Yugoslavia to Federative People's Republic of Yugoslavia on 29 November 1945, which lasted till 07 April 1963, when again the country name was changed. KM# 29 / Schön# 24 50 para. Year: 1953. Weight: 0.62g [0.60g]. Metal: Aluminium. Diameter: 17.60 mm. Edge: Plain. Alignment: Medal. Mint: Belgrade. Obverse: Numeral "50" in the center surrounded by 7 stars in the top section. Date "1953" is split at both left and right side. 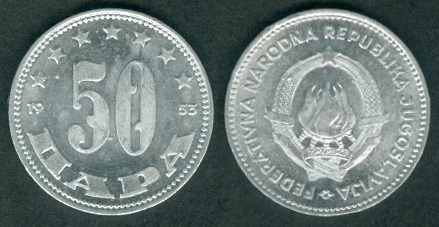 "ПАРА" (para) written at the bottom. Reverse: Yugoslavia emblem in the center with date on banner: "29·XI·1943". 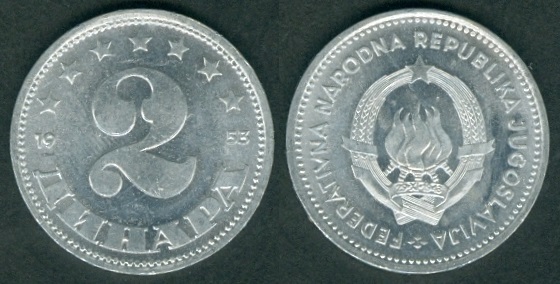 "FEDERATIVNA NARODNA REPUBLIKA JUGOSLAVIJA" (Federal People's Republic of Yugoslavia) written around. Four diamonds at the bottom. Mintage: N.A. Mintage Years: One year type. KM# 30 / Schön# 25 1 Dinar. Year: 1953. Weight: 0.90g [0.90g]. Metal: Aluminium. Diameter: 19.80 mm. Edge: Plain. Alignment: Medal. Mint: Belgrade. Obverse: Numeral "1" in the center surrounded by 7 stars in the top section. Date "1953" is split at both left and right side. "DINAR" written at the bottom. KM# 31 / Schön# 26 2 Dinars. Year: 1953. Weight: 1.27g [1.30g]. Metal: Aluminium. Diameter: 22.20 mm. Edge: Plain. Alignment: Medal. Mint: Belgrade. Obverse: Numeral "2" in the center surrounded by 7 stars in the top section. Date "1953" is split at both left and right side. "DINARA" (Dinars) written at the bottom. KM# 32 / Schön# 27 5 Dinars. Year: 1953. Weight: 1.68g [1.60g]. Metal: Aluminium. Diameter: 24.60 mm. Edge: Plain. Alignment: Medal. Mint: Belgrade. Obverse: Numeral "5" in the center surrounded by 7 stars in the top section. Date "1953" is split at both left and right side. "DINARA" (Dinars) written at the bottom. KM# 33 / Schön# 28 10 Dinars. Year: 1955. Weight: 3.15g [3.00g]. Metal: Aluminium-Bronze. Diameter: 21.00 mm. Edge: Reeded. Alignment: Medal. Mint: Belgrade. Obverse: Woman with head scarf facing left and holding a sheaf of wheat in the center. 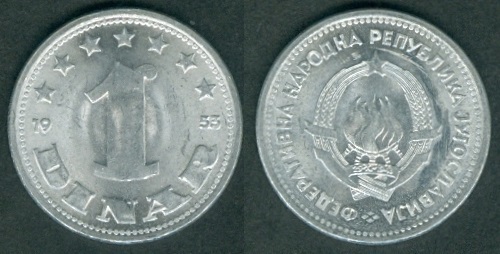 Value "10 ДИНАРА" (10 Dinars) written at the upper left side. "DINČIĆ F·M" written in two lines between neck and sheaf of wheat. Date below the Value. Reverse: Yugoslavia emblem in the center with date on banner: "29·XI·1943". 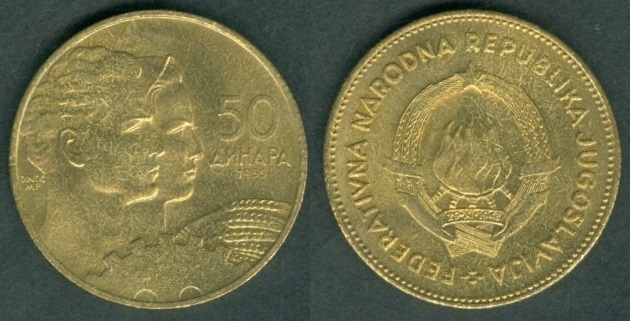 "FEDERATIVNA NARODNA REPUBLIKA JUGOSLAVIJA" (Federal People's Republic of Yugoslavia) written around. Four diamonds at the bottom. Mintage: N.A. Mintage Years: One year type. Engraver: Frano Meneghello Dinčić (both sides). Note: Some of 10 Dinara coins are missing the "DINČIĆ F·M" inscription between neck and sheaf of wheat. KM# 34 / Schön# 29 20 Dinars. Year: 1955. Weight: 4.09g [4.00g]. Metal: Aluminium-Bronze. Diameter: 23.20 mm. Edge: Reeded. Alignment: Medal. Mint: Belgrade. Obverse: Man looking right with cogwheel below him in the center. 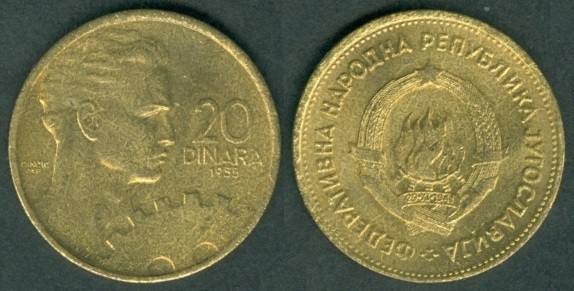 Value "20 DINARA" (20 Dinars) written at the upper right side. "DINČIĆ F·M" behind the neck. Date below the Value. Reverse: Yugoslavia emblem in the center with date on banner: "29·XI·1943". 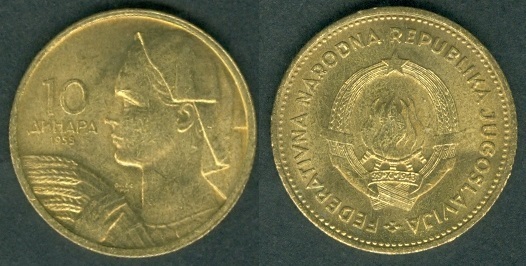 "ФЕДЕРАТИВНА НАРОДНА РЕПУБЛИКА ЈУГОСЛАВИЈА" (Federal People's Republic of Yugoslavia) written around. Four diamonds at the bottom. Mintage: N.A. Mintage Years: One year type. Engraver: Frano Meneghello Dinčić (both sides). KM# 35 / Schön# 30 50 Dinars. Year: 1955. Weight: 6.10g [6.00g]. Metal: Aluminium-Bronze. Diameter: 25.50 mm. Edge: Reeded. Alignment: Medal. Mint: Belgrade. Obverse: Man and Woman looking right with sheaf of wheat and cogwheel below them in the center. 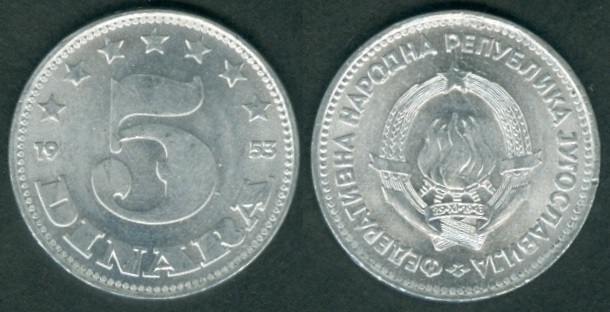 Value "10 ДИНАРА" (50 Dinars) written at the upper right side. "DINČIĆ F·M" behind the Man's neck. Date below the Value.